Product prices and availability are accurate as of 2019-04-20 12:54:11 UTC and are subject to change. Any price and availability information displayed on http://www.amazon.com/ at the time of purchase will apply to the purchase of this product. 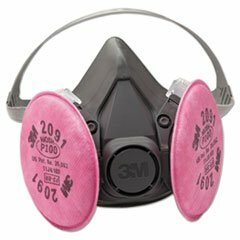 The 3M 6291 Half Facepiece Respirator Assembly includes the 3M Half Facepiece Respirator 6200 and 3M P100 Particulate Filters 2091. Helps provide respiratory protection in environments containing certain oil and non-oil based particles.